"This is a recipe I created with bits and pieces from other recipes. Great for the fall when you have extra apples and don't want to make sweets." Preheat oven to 350 degrees F (175 degrees C). Spray a baking dish with cooking spray and sprinkle with 1 pinch thyme. Place chicken breasts between two sheets of heavy plastic (resealable freezer bags work well) on a solid, level surface. 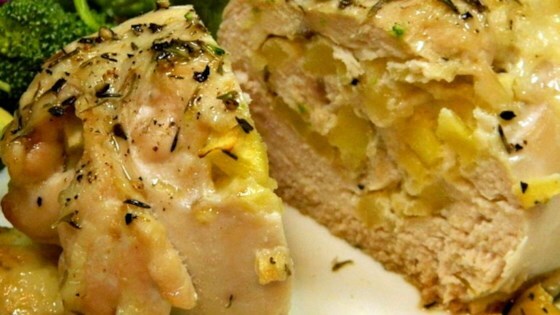 Firmly pound chicken with the smooth side of a meat mallet to a thickness of 1/4-inch. Spread apples and Cheddar cheese evenly over each chicken breast. Starting at one end, roll each breast around filling and secure the roll with a toothpick through the center. Transfer breasts to prepared baking dish. Drizzle olive oil over each breast and sprinkle with remaining thyme. Cook chicken breasts in the preheated oven until no longer pink in the center and the juices run clear, about 25 minutes. An instant-read thermometer inserted into the center of the meat should read at least 165 degrees F (74 degrees C). Really good. My guest ate two whole chicken breasts! I used jazz apples and just cut them length wise and stuffed them in. I didn't use bacon like other people did and it was still really good. we love this recipe! I have to cook it longer because we double the recipe but totally worth the wait! Next time I will slice the apples.